People who regularly go to their local tend to be happier, Oxford University researchers find. Nipping to the pub for a few hours is good for our health, a new study has found. People who regularly go to their "local" to socialise tend to be happier and more satisfied with life, say Oxford University scientists. And whether they are drinking alcohol or soft drinks, pub-goers are more engaged with other members of their community, according to the findings. Those lacking a local pub had significantly smaller social networks and felt less trusting of their neighbours, according to psychologists. 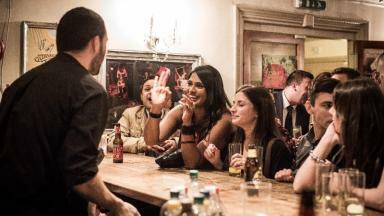 The research, published in the journal Adaptive Human Behaviour and Physiology, was gleaned from three separate investigations - a questionnaire-based study of pub-goers, an analysis of conversational behaviour in pubs, and a national survey by the Campaign for Real Ale. Our social networks provide us with the single most important buffer against mental and physical illness. While pubs traditionally have a role as a place for community socialising, alcohol's role appears to be in triggering the endorphin system, which promotes social bonding. Like other complex bonding systems such as dancing, singing and storytelling, it has often been adopted by large social communities as a ritual associated with bonding. Those who drank in local pubs were found to socialise in smaller circles of friends, which encouraged chit-chat between all the group members. People who frequented city centre bars were usually part of much larger gatherings and participated less in whole-group conversation. 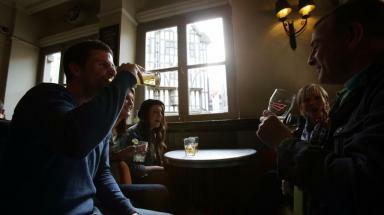 More: The Great British Pub Revolution?